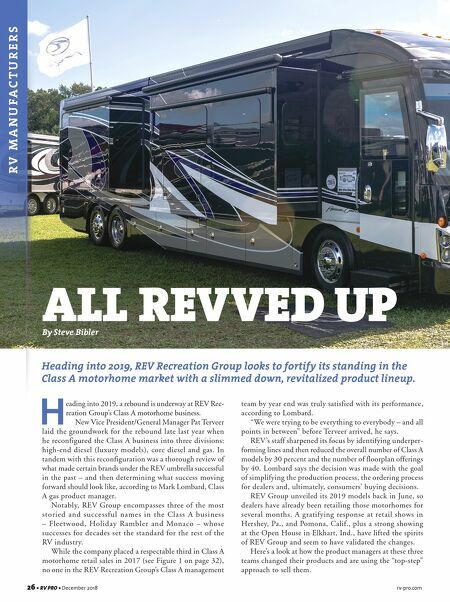 rv-pro.com December 2018 • RV PRO • 27 High-End Diesels Reviving American Coach's luxury American Dream coach may prove to be the most rewarding experience for 2019. At the September 2017 Open House, REV displayed a "de-contented" American Dream diesel pusher that allowed for a significant price decrease. "It did not go over well, as it is not what our high-end cus- tomers (dealers and retail) expect," says Janeen Gerke, division product manager for high-end diesels. "We went back to what American Coach used to be," Gerke says of the 2019 version, which has been completely redesigned for 2019. Available in both 42- and 45-foot floorplans, the American Dream has a revamped interior featuring exclusive Apex furniture, three custom hardwood choices and a recessed ceiling treatment. The American Dream offers a technology package that fea- tures Mobileye collision-avoidance technology. It also includes American Coach's Liberty Bridge on a Freightliner chassis that includes Select Drive and Ultra Steer. Select Drive passive steering provides RVers with feedback through a comput- er-aided steering system, reducing driver fatigue over extended Available in both 42- and 45-foot floorplans, the 2019 American Dream has a revamped interior featuring exclusive Apex furniture, three custom hardwood choices and a recessed ceiling treatment. 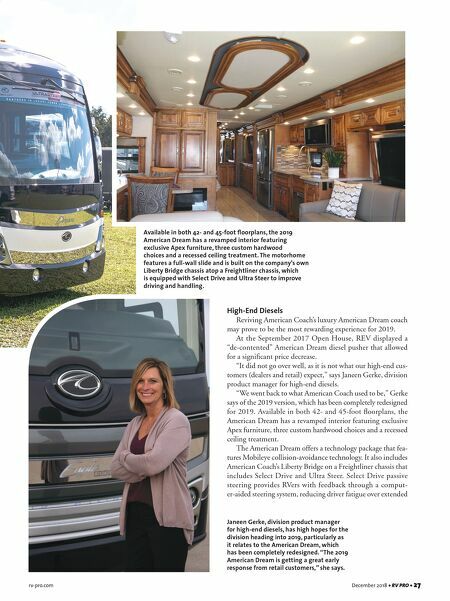 The motorhome features a full-wall slide and is built on the company's own Liberty Bridge chassis atop a Freightliner chassis, which is equipped with Select Drive and Ultra Steer to improve driving and handling. Janeen Gerke, division product manager for high-end diesels, has high hopes for the division heading into 2019, particularly as it relates to the American Dream, which has been completely redesigned. "The 2019 American Dream is getting a great early response from retail customers," she says.